Skylights featured three times on Earth Science Picture of the Day: 1 , 2 , 3 , 4 . 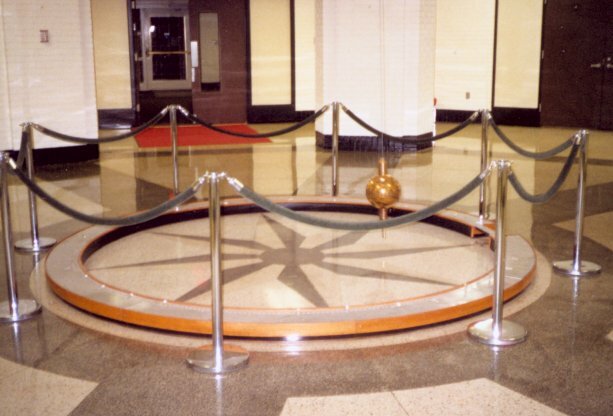 Photo of the Week.. A free-swinging Foucault pendulum (here at the University of Louisville) demonstrates the rotation of the Earth. Astronomy news for the week starting Friday, May 16, 2003. With the full Moon and lunar eclipse now past us, the Moon spends the week waning through its gibbous phase, finally reaching third quarter the night of Thursday the 22nd a few hours before Moonrise in North America. The night of Friday, the 16th, the Moon will make a nice pairing with Antares (the star to the right of the Moon and hard to see in the Moon's brilliant glow). Watch then the night of Sunday the 18th (actually the morning of the 19th) as the Moon "bottoms out" at its lowest point in its path, south of the ecliptic and seen against the stars of the Little Milk Dipper of Sagittarius. During the day on Wednesday the 21st, the Moon passes south of Mars, and will therefore appear to the west of the planet earlier that morning, and to the east of it the morning of Thursday, the 22nd. Saturn, which has been beautifully with us all year, is now making its last "nighttime stand," the planet setting only half an hour after evening twilight ends. Glorious Jupiter, however, remains a lovely evening object. Still in Cancer just to the east of the Beehive Cluster, the planet is slowly moving eastward against the stars, and not setting until just after 1 AM Daylight Time. As the giant planet sets, however, it is replaced by brightening Mars, which rises in the southeast deep in central Capricornus very nearly in opposition to Jupiter. This same week (on Wednesday the 21st) Mars passes conjunction with dim telescopic Neptune, the red planet two degrees south of the last of the big planets. (Pluto is smaller than our Moon and has dual residence in the standard planetary system and in the Kuiper Belt of primitive bodies that make our short-period comets). While Venus (which for so long dominated the morning) is still visible, it is getting much more difficult to see, as it rises in twilight only about an hour before sunrise. Look to the east northeast to see if you can find this twilight "morning star" just above the horizon. Follow the arc of the handle of the Big Dipper to the south as it passes through Arcturus and then down to Spica, the luminary of Virgo, the constellation that holds the autumnal equinox. Two "boxes" flank this bright star, after Regulus in Leo the closest first magnitude star to the ecliptic. To the right is a distorted square that makes Corvus, the Crow or Raven. Just as the two front bowl stars of the Big Dipper point northward toward Polaris, the top two stars of Corvus point eastward to Spica -- and are also known as "the Pointers." To the left of Spica is the next constellation of the Zodiac, a larger distorted square that makes most of Libra, the Scales, its two brightest stars once being the "claws" of the yet-next zodiacal constellation over, Scorpius, the Scorpion.